By 6 April 2016, all dogs in England and Wales must be micro-chipped ( with Scotland to follow) - it's the law! As well as being micro-chipped, it is still a legal requirement for dogs to wear a collar and tag with the owner’s name and address on it when in a public place. Micro-chipping your pet gives them the best chance of being identified and returned to you if they become lost or stolen. A pet microchip is a tiny computer chip that’s about the size of a grain of rice. It contains a unique code that matches up to your pet’s details. Micro-chipping your pet is a quick and simple procedure. The chip is inserted under their skin, usually around the scruff of the neck, using a needle. It takes seconds. 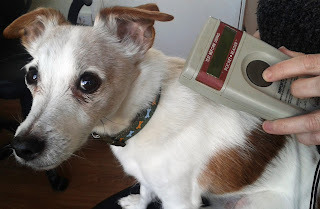 Once in place, the microchip can be detected immediately with a handheld device that uses radio waves to read the chip, displaying a unique code attached to your pet’s details. Once your pet is chipped, they must be registered to the database, so it is important that the paperwork we provide you is posted to the company ( or it can be completed on-line). You should receive confirmation from the database that your pet has been registered. If you move and have a change of address, phone number or a change of name, don’t forget to update your pet's details. To do this, get in touch with the database that holds your pet's details. Depending on which database your pet is registered with, you might be able to do this over the phone or online, or you may have to do so by post. This is so important as if the information is incorrect then you can't be traced.